Archbishop Anil Joseph Thomas Couto was born in Porvorim Village of Bardez, the Archdiocese of Goa and completed his schooling and seminary studies there.In 1967 he joined the minor seminary.He completed philosophy in 1973 and did regency in 1976 at Boys Town, Prem Nagar, Quepem, Goa.In 1977 he joined the Archdiocese of Delhi and completed theology studies in 1981 from Vidyajyoti college of theological studies. He was ordained priest on February 8, 1981. followed by two months each at Paharganj and Cathedral. In 1981 he went for mission experience at Varanasi. In 1982 (four months) he was sent as an Assistant Parish Priest at St. Joseph’s Church, NIT-5, Faridabad. Between 1982-1988 he was appointed Priest-in-Charge of ‘Prabhat’, Catholic Church, Rohtak. In 1988 he was appointed Assistant Parish Priest at St. Michael’s Church, Prasad Nagar and Principal of St. Michael’s Junior School. In 1991 he became the Rector of ‘Pratiksha’, Major Seminary, Delhi. Between 1991 - 1994 he Completed M.Th. in Ecumenism at Vidyajyoti. Thereafter between 1994-1998 he went for his Doctorate in Ecumenical Theology at St. Thomas Aquinas Pontifical University (Angelicum), Rome. On his return in 1998 he was appointed Rector of 'Vinay Gurukul' Minor Seminary, Gurgaon. He was appointed Episcopal Vicar in 1999 and appointed Auxiliary Bishop of Delhi & Titular Bishop of Cenculiana on January 17, 2001. 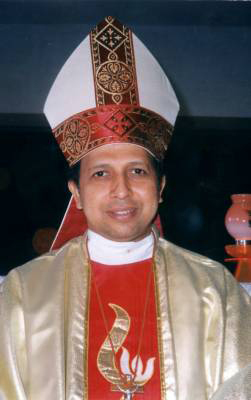 His Episcopal Ordination was held on 11th March, 2001. He was appointed Bishop of Jalandhar on 24th February 2007 and installed as Bishop of Jalandhar on April 16, 2007. Appointed Archbishop of Delhi on 30th November 2012. Installed as Archbishop of Delhi on 20th January 2013.